See how the aristocrats of Florence lived during the Middle Ages and Renaissance on a private 1-hour tour of the gorgeous Palazzo Davanzati. Make your own way to the Palazzo Davanzati to meet your guide for your private tour. Learn about the history of the building, which was built in the late 1400s and purchased by the Davanzati family in 1578. Your guide shares details about the architecture, furniture styles, and the extensive collection of artifacts as you walk through the sumptuously decorated rooms. 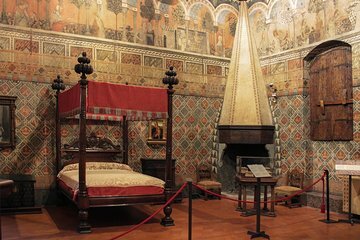 It now is known as the Museum of the Ancient Florentine House, and it provides a glimpse into the lifestyle of the aristocracy in Florence during the 14th and 15th centuries.